This stand-alone application collects information from a single OCS Inventory NG server in order to populate the iTop CMDB with the collected Servers, PCs and Virtual machines. 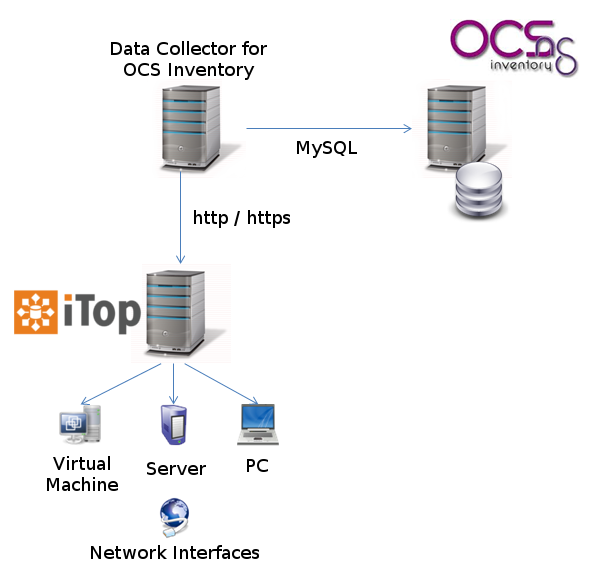 The collector uses the iTop data synchronization engine to synchronize the information between OCS Inventory and iTop. Automatic creation and update of the Synchronization Data Sources in iTop. 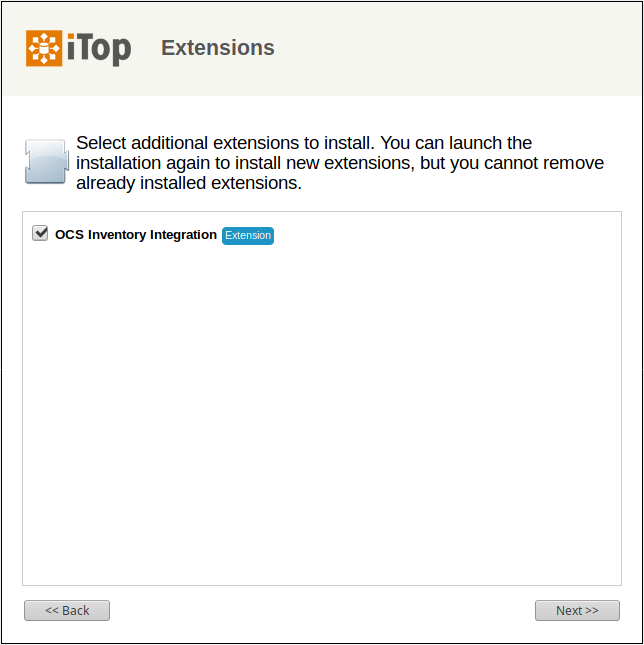 An optional small extension is available to display an extra tab “OCS Inventory” on synchronized PCs, Servers and VirtualMachines. This tab displays the OCS page for the device (using an IFRAME). 2018-09-04 1.0.4 First public version. No longer requires an alteration of the data model. 2015-05-20 1.0.1 A few bug fixes: support of Windows file names (i.e. c:\Program Files\…). Conversion of SPEED from '100 Mb/s' to '100'. Forcing a NON case-sensitive comparison for 'Laptop' et al. If your iTop is accessed using HTTPS, then the same must be true for OCS Inventory otherwise the inline frame of OCS Inventory inside iTop will not display because of browsers's security restrictions. There is no single sign-on between iTop and OCS, so you'll have to login to OCS when displaying the OCS tab. An access to the iTop web services (REST + synchro_import.php and synchro_exec.php). Note: starting with iTop 2.5.0, the user must have the profile REST Services User in iTop. Expand the content of the zip archive “ocsng-data-collector” in a folder on the machine that will run the collector application. This machine must have an SQL access to the OCS NG database and a web access to the iTop server. create the file conf/params.local.xml to suit your installation, supplying the appropriate credentials to connect to OCS NG and iTop. itop_password Password for the iTop account. By default the data collection configuration is defined in the file collectors/params.distrib.xml. Do not modify this file! If you need to adapt the configuration, create a file named params.local.xml in the conf directory and copy/paste the needed definitions into it (the structure of both XMl files is the same). This configuration defines which SQL queries have to be executed on the OCS NG server to retrieve the data and synchronize with iTop. For each class of object to import into iTop (PC, Server, VM, Brand, Model, OSVersion OSFamily), a Synchro Data Source is created by the collector application. Each collector is associated with an SQL query (via the parameter <name_of_the_collector>_query). This query must return column where aliases (i.e. “name” of the columns) correspond to the expected fields for the corresponding Synchro Data Source. Since the synchronization of PCs, Servers and Virtual Machines all rely on their own SQL query, it is important to make sure that the results of these 3 queries do no overlap. Otherwise the same “system” will be imported several times in itop (for example as both a PC and a Server). Synchronize the collected data with the existing iTop CIs. Once you've run the data collector interactively, the next step is to schedule its execution so that the collection and import occurs automatically at regular intervals. The data collector does not provide any specific scheduling mechanism, but the simple command line php exec.php can be scheduled with either cron (on Linux systems) or using the Task Scheduler on Windows. For optimal results, don't forget to adjust the configuration parameter full_load_interval to make it consistent with the frequency of the scheduling.